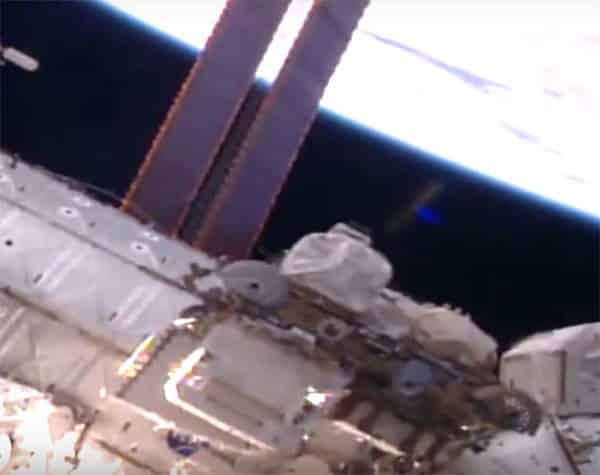 On December 5, NASA’s Live ISS stream gave us another solid proof that the space station is routinely scouted and analyzed by a variety of crafts and entities. This time, the protagonist of the show was a classic object in the field of ufology — a cigar-shaped golden UFO. Spotted by veteran UFO hunter Streetcap1, the UFO was present on the live feed so thousands must have seen it when it made its sneaky appearance. In the video uploaded to YouTube, a long, metallic-looking UFO is seen very close to the space station. It definitely has some kind of propulsion system as it can be seen firing up and emitting red flashes at timed intervals, perhaps its own stabilizers activating to keep it in sync with the ISS. Even more intriguing is a bright blue flash coming from the object’s side. Our own ships don’t do that but an advanced UFO capable of harnessing zero point energy from the so-called vacuum might fit the bill. While slightly out of focus, we can discern that the object is solid in nature and appears to be made out of a golden material. Could it be really gold that covers the outside of this ship? The precious metal is a very good electricity conductor and is also very resistant to corrosion. It is also very likely that gold has some other interesting properties when it comes to space travel but we’ve yet to master this technology so we don’t know what’s what. What we do know from our own historic relationship with this lustrous chemical element is that gold exerts an unexplained attraction on the human mind. This fascination could very easily be explained in the context of our history as children of the Anunnaki. They came here to take Earth’s gold and in the process, they engineered mankind as a suitable workforce to handle the extraction process. Their need and love for the precious metal must have shaped their interests to such an extent, it probably rubbed on our ancestors and never came off. Keeping this in mind, is it possible that this cigar-shaped golden UFO might be one of their ships? Countless theories claim that even though they left, the Anunnaki still keep a watchful eye on our progress as a species. To them, our own foray into outer space must seem like a reflection of their own character, forever inscribed in our genome. Previous Article← Amazing! Three perfectly aligned ‘mile high towers’ found on Mars!